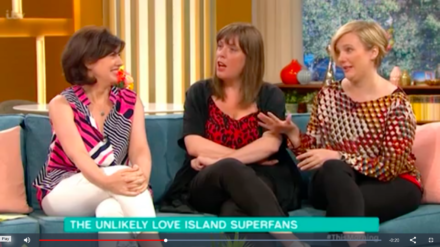 Lucy Powell, Jess Phillips and Stella Creasy have made no secret of their Love Island viewing habits, and today the Labour MPs revealed they watched the reality show between votes in parliament. The ITV2 dating show involves attractive non-celebrities living in a villa in Mallorca for six weeks as they try to successfully couple up and avoid getting ‘mugged off’. It has become a hit in Westminster, with MPs, staffers and journalists all sharing their hot takes on the contestants in the corridors of power and on Twitter. The Independent‘s Tom Peck even started writing about the show daily. Today the Labour MPs were excited when offered Love Island water bottles. As LabourList revealed on Twitter in June, Powell was appointed early – before public votes had even started – as Love Island chief whip of the parliamentary Labour Party. But the MP for Manchester Central has expressed disappointment with series three. On Twitter, Powell described Josh and Kaz as “a bit boring” and said the show had suffered from “too much churn this year”. LabourList understands that most of the PLP including Powell supports Jack and Dani, while Josh and Kaz have not acquired much backing so far. As for individual candidates, there are fans of ‘old’ Laura, who has gained sympathy after being ‘pied’ (rejected) several times. Perhaps surprisingly, controversial islander Georgia won over several MPs too. With just a few days to go until the final, favourite-to-win couple Jack and Dani seem as popular with Labour MPs as they are with the rest of the country.